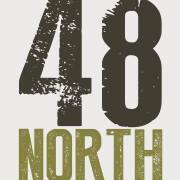 48 North is a taphouse located in the St. Johns neighborhood. They offer 48 taps of craft beer, wine, cider and good eats. They are North Portland's largest tap selection of craft beer, wine and cider. Their address is 8801 N Lombard Street, Portland, OR 97203. They are working to open up as soon as possible. Stay tuned for more information!